« Sony to no longer sell certain sensors to other manufacturers? Greetings [NR] readers, my name is Jason Chu (otherwise known as “theinfinitypoint” on Disqus) and I’ve been a reader of Nikon Rumors for a very long time. Today I want to share with everyone some of the work I’ve created with my Nikon cameras, specifically my astro-landscape time lapse videos shot at astronomical observatories (videos are below). 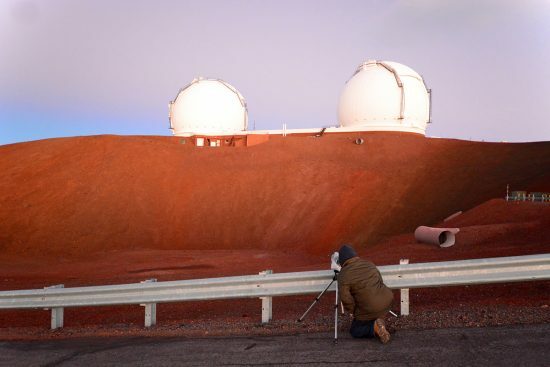 Being a Hawai`i-based astronomer, I have special access to the world’s leading ground-based observatories on the mountain of Mauna Kea on the Big Island of Hawai`i. While I would love to discuss my astronomical research and what sort of data we collect, use, and analyze, that would make this post too long! 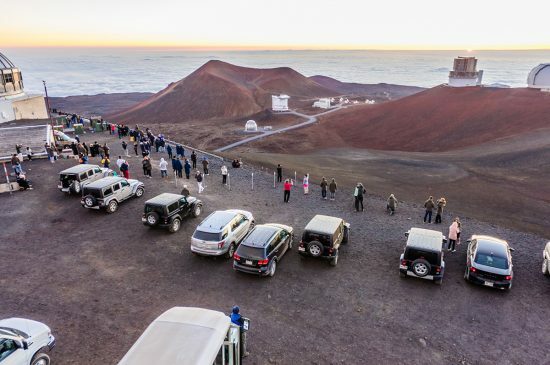 A brief background on astronomy in Hawai`i, the Mauna Kea Observatories is a collection of about 12 telescopes situated 13,796 feet above sea level. A gentle mountainside with thousands of miles of open ocean around it means that the air flowing over the island is very laminar (technical word for smooth), and so it provides the best conditions for observing the night skies. In addition, the high altitude of the observatories means that sits above most of the water vapor (and thus tropical weather) in the Earth’s atmosphere. 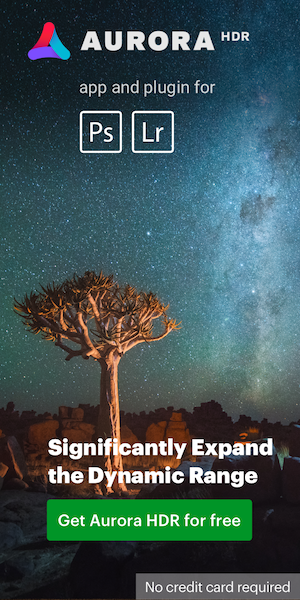 Combining these two conditions, along with the fact that there’s very little light pollution (again we’re in the middle of the ocean), make it the ideal site to observe the heavens. For this reason, the mountain hosts some of the largest telescopes in the world, with primary mirror diameters between 8-10 meters. Crop from the previous panorama showing most of the telescopes on Mauna Kea, as seen from Mauna Loa. Although a lot of astronomical observations can now be done remotely over the internet (indeed people literally half way around the world have done remote observations from Mauna Kea), some telescopes still allow, or require observers to physically travel to the telescope for the observations. Since I live so close to them, I often travel up the mountain to use the telescopes for my research. 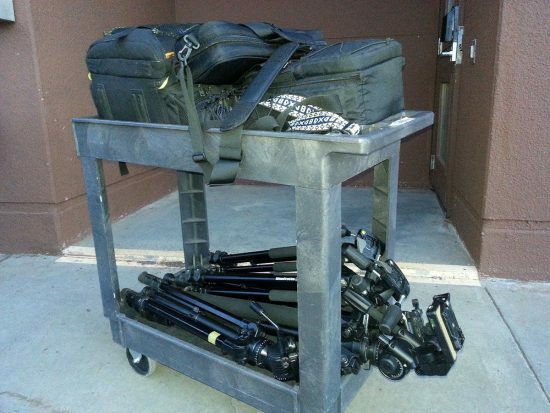 And when I do go, I always bring all of my photo gear for my own “observations” as well. Tons of tourists watching the sunset after I had set up a shot on one of the telescope’s catwalk. I originally got into time lapses because I was trying to create star trail images using back-to-back exposures, but then I realized I can make time lapse movies out of the data (photos) as a secondary product (always a good thing if one does that in science!). Shooting time lapse on Mauna Kea can be extremely challenging and intense: Not only do I have to plan the shot taking into account sunset/sunrise times and the moon phase, but I also have to contend with the temperature (average 0 C at night), and weather conditions such as snow (yes, it snows in Hawai`i! ), fog, ice on the ground, and high winds (up to 60 MPH or more!). Add to that the effects of high altitude on the body (60% of the oxygen at sea level) and fatigue from staying up all night, makes it extremely challenging when doing photography on the mountain. The low oxygen can even interfere with one’s ability to make decisions, another hazard from working at high altitude. As far as my gear goes, almost all of it is Nikon. Although my gear has evolved throughout the years, my current bodies include: D800, D750, D700, D7000, and a D5000 if I really needed it. All of my bodies are equipped with battery grips to enable long shoots at freezing temperatures. I typically shoot multiple sequences simultaneously during the night which is why I usually bring 2 backpacks full of gear up with me plus tripods. As far as lenses go, my go-to lenses are my 14-24mm f/2.8G (two of them actually), 20mm f/1.8G, 28-70mm f/2.8D, 24-70mm f/2.8G, 85mm f/1.8G (for shots of individual telescopes), and a Rokinon 16mm f/2 for DX. I’ve also used my Nikon 55mm f/1.2 pre-AI lens on my D5000 once as well (at f/2), so older 1970s optics still work! I’ve also borrowed the 17-35 f/2.8D and a 16mm f/2.8D fisheye when needed. I’m thinking of eventually getting the Nikon 105 f/1.4E lens, since it is sharp wide open and controls sagittal coma flare quite well (not to mention bokeh for my portrait shoots!). As with any night shoots, tripods are a must, and I now have 3 Manfrotto tripods that I use, plus borrowing some from friends. All of them are aluminum, since carbon fiber is quite light and can easily blow over or vibrate in 20+ MPH winds (which happened to a fellow photographer). Obviously stability is important when shooting time lapse, otherwise one would get jitters (camera shake) in the final video. Shooting Mauna Kea from Mauna Loa in the moonlight. The right camera is a time lapse I shot at 500mm of the observatories on the summit of Mauna Kea. In the center I was shooting a star trail shot using a Nikon FE with the 28-70mm f/2.8D lens. On the right is another time lapse shooting at 85mm. Planning out time lapse shots can sometimes be as easy as deciding on the spot, and other times requiring extensive planning months in advance. Many of my shots are timed to coincide with astronomical objects rising or setting, such as the Milky Way, the Andromeda Galaxy, planets, Polaris, and of course the Sun and Moon. To that end I use Google Earth extensively for terrestrial planning, combined with Stellarium (a free computer-based planetarium software) for the sky. Occasionally I use The Photographer’s Ephemeris as well to help plan for sun and moon rise and set related shots. Photo of me manually exposure ramping a full day to night transition shot. Apart from capturing natural events, a lot of my planning is also done around telescope activity. One of my favorites, and one that is seen in a lot of my shots, are orange lasers emanating from some of the telescopes. Simply speaking, these lasers are used by the telescope’s adaptive optics system to correct the image distortion caused by an atmosphere in constant movement, giving astronomers Hubble-quality images from the ground. Photographically speaking they are super cool and awesome to capture, and in fact most of them are bright enough to be seen with the naked eye, especially if the Moon is not out. 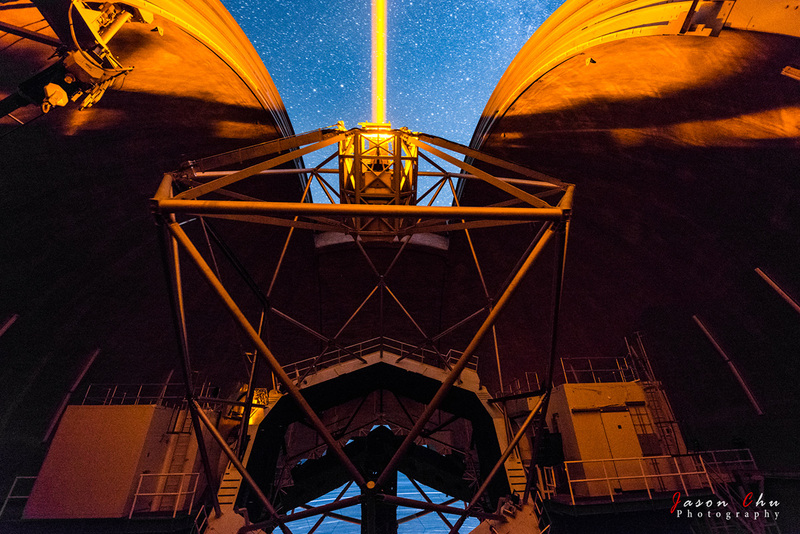 The orange laser of an adaptive optics system propagating into the night sky. One of my most exciting projects was to shoot from the inside of the WM Keck Observatory on a laser night. This observatory has two identical telescopes both 10 meters wide, and both equipped with the brightest lasers on the mountain. I knew ahead of time that on this particular night the observer would be using both telescopes and lasers on the center of the Milky Way. It took 1 year of getting all the permits and satisfying all of the safety regulations before I was able to shoot it. In the end I had a personal record of 8 cameras simultaneous running time lapses all from different angles inside and outside the telescope. In some of my other shoots, an observatory director has also given me permission to shoot from the catwalk from one of the telescopes. All the gear I used after my successful Keck dome interior shoot. Shooting the actual time lapses can take a very long time, since by definition a time lapse compresses the passage of hours to only 20-30 seconds in the final video. 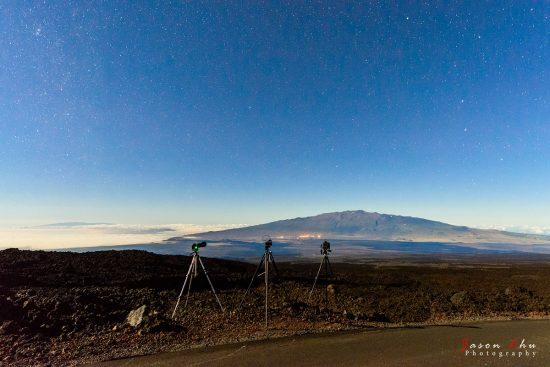 While doing night time lapses on Mauna Kea, each individual frame usually has an exposure time of around 15-30 seconds at f/2.8 or faster if possible. To truly capture the very dark scene, my ISO is usually at 6400 unless the moon is near the full phase, in which case I’ve gone down to ISO 1600 at times. One other area of concern is field rotation: since the sky is turning (due to earth’s rotation about its axis), the stars will appear to move, the amount of trailing depending on the focal length and shutter speed (and also where the camera is pointed in the sky). This is another reason why (ultra)-wide angle lenses are useful – longer exposures are possible which means less noise in the final frames. This is also why my 85mm f/1.8G lens is useful, the extra 4/3 stop gain in aperture over an f/2.8 lens compensates for the shutter speed enough so that stars don’t trail as much in the final image. In some of my shots, I also use a Cinetics panning motor, which allows me to create panning time lapse sequences. Despite some small quirks (the requirement that the camera be in bulb mode, which makes day/night transitions more difficult when I need to manually control exposure ramping), this is one of my favorite tools I use to introduce some dynamism in my shots. As with any sort of landscape shoot, weather can sometimes become a problem. In cases where precipitation is likely or the winds are high and lots of dust is being blown around, I wrap my camera in a plastic bag (the kind you put vegetables in in the grocery store), cut a hole for the lens, then use a rubber band or tape to hold the bag in place. 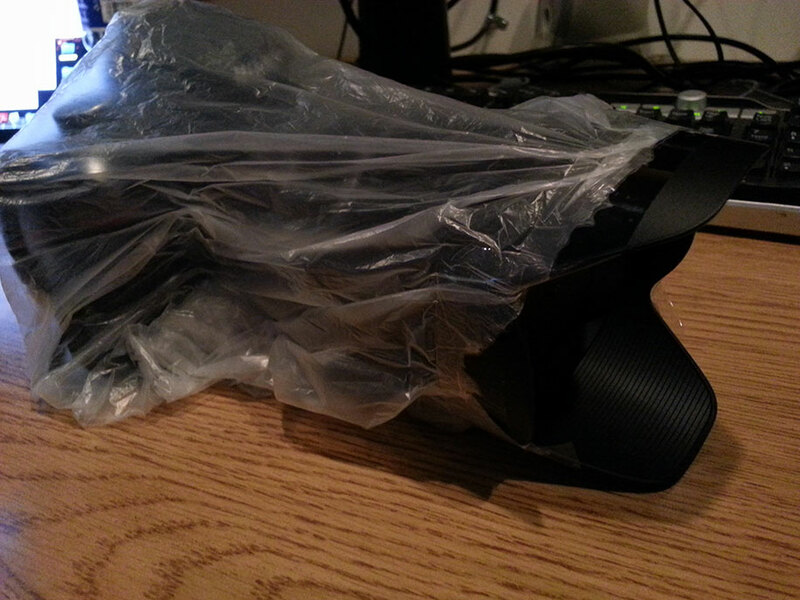 I then screw the tripod plate through the plastic bag to mount it on my tripod. However there were a few times my camera got thoroughly wet from condensation, but thanks to Nikon engineering (or luck) I never got any issues. On-the-fly weather sealing before deploying one of my cameras. A typical time lapse sequence is anywhere between 400-800 individual frames, fired using the built-in intervalometer on the body. I always shoot in raw which gives me a wide post-processing latitude, which is especially useful for shadow recovery in dark scenes. On a typical night I produce around 40-70 GB of data, which I offload onto my laptop and another external drive for immediate data protection/redundancy. When I return to my lodging in the morning, my room is usually covered with battery chargers everywhere. In fact I always bring a power strip just so that I can parallelize all the recharging. 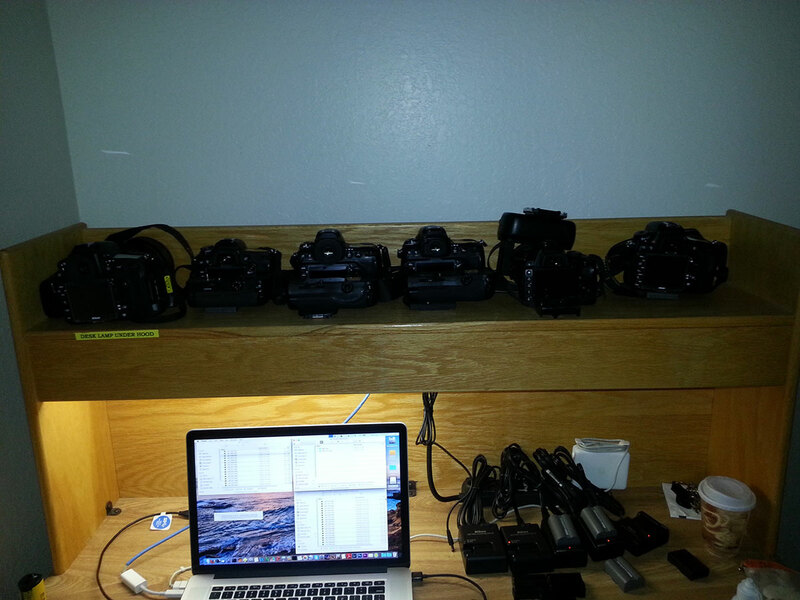 All of my cameras and their battery grips on the shelf back in my room. On the lower left I am recharging all of the batteries for the next night. In the 5 years I’ve been going up the mountain, I’ve racked up a total of 66,004 time lapse frames (not counting the very few that completely failed), shot over a total of 520.4 hours on the mountain. Played back at 24 FPS this corresponds about 46 minutes of footage. Below are two of my most recent time lapse videos of Mauna Kea, with more on my youtube channel (feel free to subscribe), including non-astronomy ones. If you have any questions feel free to ask below, I’ll do my best to answer them all. Thanks for reading, and I sincerely hope you enjoy my work! This entry was posted in Other Nikon stuff and tagged astrophotography, [NR] Guest Posts. Bookmark the permalink. Trackbacks are closed, but you can post a comment.